are provided in the online appendix. All readers—-theoretical econometricians/statisticians, applied economists/social-scientists and researchers/students—-will find something useful in the book from different perspectives. 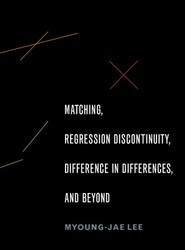 The book under review gives an up-to-date and concise treatment of the three most recent and widely applied empirical methods to deal with confoundedness in microeconometrics, i.e., matching, regression discontinuity and difference in differences. This book gives a timely update on the author's previous book Microeconometrics for Policy, Program, and Treatment Effects with a particular concentration on these three most in fluential methodologies. This book serves as an excellent reference for both graduate students and researchers working in the field of microeconometrics.